Weekend "Dodger Blue" Jerseys To Benefit S.A.F.E. House Domestic Violence Shelter. 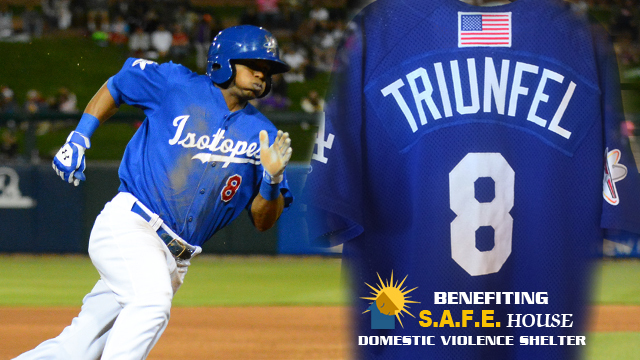 In recognition of "Domestic Violence Awareness Month," the Albuquerque Isotopes will be auctioning off authentic "Dodger Blue" weekend jerseys with net proceeds benefiting S.A.F.E. House Domestic Violence Shelter. More than 40 game-worn jerseys featuring player nameplates will be auctioned off exclusively online, and an additional 26 authentic jerseys without nameplates will be auctioned. "With October being domestic violence awareness month, we saw this as a great opportunity to provide a unique, game-used item to our fans and give something back to the community," said John Traub, General Manager of the Isotopes. "S.A.F.E. House does great work in our community, and we are honored to be able to donate funds to help them fulfill their mission." The auction will begin Friday, October 17th, at noon MT and run through Friday, October 24, at noon MT. To bid on a jersey, visit http://isotopes.milbauctions.com. Opening bids for game-worn jerseys with nameplates will start at $180, while other authentic jerseys without a nameplate will begin at $150. Each jersey will also be accompanied by a Letter of Authenticity. "We are truly grateful for the support we have received from the Isotopes over the last several years," said Michele Fuller, Executive Director of S.A.F.E. House. "The jersey auction is an exceptional event because it demonstrates both their awareness of domestic violence and their commitment to helping end that violence in our community." Traditionally donned by Albuquerque during weekend home games, the jersey features "Isotopes" script lettering across the front with the Topes' "A" logo on the right sleeve and the Los Angeles Dodgers' "LA" logo on the left sleeve (see photo attached). S.A.F.E. House Domestic Violence Shelter aims to shelter and empower survivors of intimate partner domestic violence and to improve the way New Mexico responds to domestic violence. S.A.F.E. House strives for a community that is free from all forms of oppression and violence and serves more than 1,000 families through our doors annually. S.A.F.E. House provides programming aimed at healing the wounds, breaking the cycle, and improving the lives of families in our community. More information about S.A.F.E. House Domestic Violence Shelter can be found at http://www.safehousenm.org.